When the children ask for something to do this summer during gatherings or while playing with other kids, suggesting fun games to play is a great option. Kindergarten and grade school children experience sharing, fun, socialization skills, culture education and competiveness on a healthy level while playing games. Culture is taught by offering suggestions of international games for children so they can learn how children in other parts of the world entertain themselves. Kids love to learn and have fun. Combining the two is the perfect way to enhance their lives. Teaching kid's games introduces new ideas which stimulate their imaginations. It also brings about healthy activity instead of sitting in the house bored. Simply socializing with other children is an emotionally healthy, productive project. Fun games that keep kids entertained with mental stimulation, movement, and the use of imaginative fresh ideas will keep them busy for hours. Encouraging them to learn about the location in the world from which the game came is a project that educates them about the children of that country as well. While introducing your child to international games, you may wish to have them locate the country of the game's origin and read some of the details about the culture of the country as well. It's a great opportunity to spend time with your children and to fit in a valuable educational project. “Keep the Ball” is a popular Mexican game. Divide children into two teams. There is no set number for team size. One child throws the ball into the air. The children jump for the ball; the one to catch it is in charge of keeping the ball for his or her team. Team members pass the ball back and forth, safeguarding it from the other team. The ball cannot be passed back to the player that originally gave it to you, at least during that turn. You may pass the ball back to them during later play. When the pre-designated time is up, the team with the ball in their possession is the winner. This game is similar to "Keep Away," which is played in the United States. “Oba” is a traditional Colombian game that is played with a wall and ball. Any number of people can play Oba at a time. Choose a player to begin. The chosen player throws the ball against the wall. During the ball's travel time, players must try to catch the ball, after doing any form of movement they choose. Movements can something like jumping on one foot, dancing, clapping your hands in the air, etc. The player throwing the ball against the wall decides which movement they wish. Players that threw the ball must catch the ball after performing their movement. Each player, in turn, throws the ball against the wall and repeats the first player's actions. The ball must be caught to complete the play. If the ball is not caught, the player must pass the ball to the next player. Play continues until another player completes the action, then catches the ball. The player that completes the turn is then the player who chooses the action to be performed. Oba is a part of the Colombian culture and is played by children all over the country. It is similar to the game "Horse" played in the United States, however, the use of a basket and basketball are not used. The winner of this game is the one to perform the most actions correctly. Card games are normally simple but fun. For the game "Aang-Aa-Biao," children can make their own cards using a piece of poster board. Pictures are drawn on the cards, and the pictures have to match at least one other card. Regular poker cards will also work as they are set up in groups of four. Ang-Aa-Biao is a card game played quite often in Taiwan. Cards required, but a deck of regular cards can be used. Each player takes their turn by flipping a card over from their pile. If the card matches another card on the ground, slap your matching card down on top of the ground card. If you are the first player to get your card on top of the card that was flipped and they match, you win that card. The player that has the most cards at the end of the game wins. A winner is decided when all cards are gone. In Taiwan, players who win the game earn respect from other children as the best player of Ang-Aa-Biao. A similar card game is played in the United States and called "War". Loteria is a card game that is played in Mexico, and it is part of the Mexican culture. The cards come in a pack of ten large cards with 54 smaller cards. The pictures are of objects, people and animals. This is a game played with 20 or more people. Each player chooses a large picture card. One player is designated to be the "caller". Cards are available to the caller that contain all pictures of each item on the large cards. The caller selects a picture card from a pile that is upside down and placed in front of them. If the players have the selected picture on their card, they mark it by placing a button, stone or bean on top of the picture. Once all of the pictures on their card have been selected and their card is completely marked off, they win the game. The player with the filled card must call out, "Loteria!" This game is much like Bingo in the United States. Bingo cards usually feature numbers; however, Loteria is played for children with illustrated cards. Purchase Loteria cards from Barnes and Noble bookstores or Stampington & Co. The traditional marbles game is popular the world over. Players shoot their marbles at their opponent’s marbles and try to hit them. If they strike their opponent's marble, they win that marble. Children in Turkey, Cyprus and Indonesia play this traditional. Even six year olds play games with marbles. It is a sign of “power” among children in Turkey to have the most marbles. Children that are poorer and don’t have a lot of money try hard to save up what little money they have to purchase more marbles. Begin by drawing a triangle. Use chalk on hard surfaces, but a stick works best on pavement or harder surfaces. Place all the marbles in the middle of the triangle. Taking turns, children shoot their marble into the triangle. The object is to hit the other marbles. Any marbles that are shot outside of the triangle are collected by the player who hit them. The game continues until all marbles inside the triangle are gone. In Turkey, the object of the game is to win as many marbles as possible. This is a popular competitive sport in elementary schools so most Turkish children practice in their free time. Children in Cyprus play a marble game called Peirilia. This marble quest is more like the marble games played in the United States. Draw a triangle in the dirt or on the pavement. Keep one marble as your shooter. All the players place the rest of their marbles in the middle of the triangle with a space of about 2 centimeters between each one. Players count off two feet from the triangle on the outside, and draw a line at that distance. Players stand by the triangle, shooting toward the line two feet out. The player that comes closest to the line is the first player to go. Player one shoots a marble toward the marbles inside the triangle. Any marble hit is won by that player. Play continues until all marbles are gone. The player with the most marbles at the end of the game wins, and all the marbles collected are his or hers to keep. Marble games in Indonesia are played like that of the other countries listed above. A circle is drawn and the marbles are kept if they are hit. 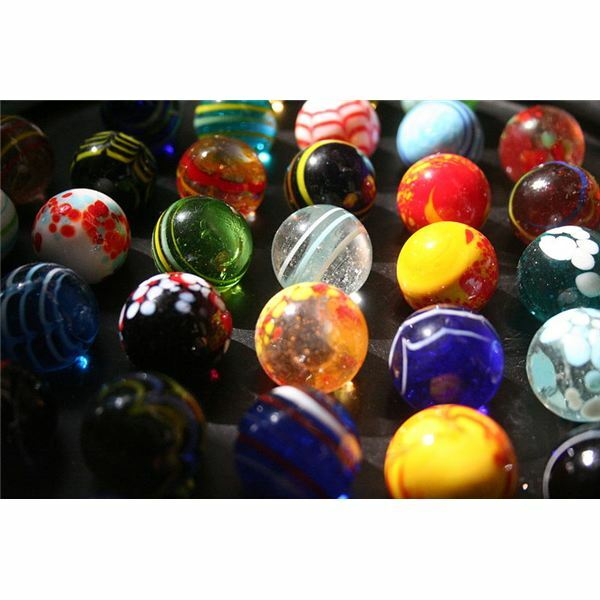 The game of marbles is definitely a universal game that is played predominately the same way in many countries. Children love to get together and play games of all types. Circle games such as “Duck, Duck, Goose” are one of their favorites. All the players sit in large circle. One child remains outside of the circle and is designated as "it". The player designated as "it" walks around the circle, touching each player's shoulder. As "it" touches each shoulder, he or she must say, "duck". When "it" decides which player they want to choose, they touch the shoulder and say, "goose!" Both players run outside the circle with the chosen player chasing "it". Both race for the open spot in the circle. They must go full circle. The player that makes it first sits in the open spot. The loser of the race gets to be "it" for a new round. Game play repeats until it is determined by players to be over. Duck, Duck, Goose is a common game played in the United States. Children in classrooms, schoolyards and at home play this game. In China, children play a circle game known as "Caught You!" which is played quite often at school and home. The game can be played with a large group of players or a smaller group. All you need is a piece of cloth and a ball. An adult or one player chosen by all is asked to be the referee. All the children except one sit in a circle. Game play begins with one player holding the ball. The child outside the circle is blindfolded. The referee declares that the game has started. The ball is passed around the circle. The blindfolded player can say "stop" at any time. When the signal to stop is given, all players in the circle must freeze. Whoever has the ball when the command to stop is given is the player who must sing a song or tell a story. The player outside of the circle is replaced about every five minutes or according to a designated time period chosen before the game begins. International games for children allow kids to learn about various parts of the country as well as the origins of these games. Not only do they keep children busy, but they also give them the opportunity to learn how children in other cultures play. All of these games teach hand-eye coordination, good sportsmanship and socialization skills. Children will value these experiences during their growth and into adulthood. We all remember games we played as children and most are associated with good times had by all.